This post is written in preparation for a lecture I will be giving while soaking in the hot springs at Ojo Caliente in New Mexico, in the framework of a retreat on Chinese herbs and the Chinese medicine classics taught by Z’ev Rosenberg and myself in Taos on August 19-23, 2018. For more information on that retreat, see here. My interest in water is obviously also inspired by my current life on the Puget Sound on Whidbey Island where I go wade, swim, and play in the blue stuff almost every day. Thanks to my daughter for modeling as a mermaid. While late Imperial China is not my specific area of expertise, I have always been intrigued by Li Shizhen 李時珍 and his grand masterpiece, the Bencao gangmu 本草綱目 “Classified Materia Medica,” and consult it frequently in my research in medical history. Anybody interested in the natural sciences in Chinese history needs to read Carla Nappi’s wonderful book on the subject, titled The Monkey and the Inkpot: Natural History and Its Transformations in Early Modern China! If you haven’t, the following information is meant to give you a little taster. 1. The Ming dynasty (1368-1644) was a return to indigenous Chinese rule that followed after the Yuan 元 dynasty (1279-1368) when China was under Mongol control. While undoubtedly traumatic and associated with a horrendous loss of Chinese lives and cultural treasures, China’s incorporation into the Mongol empire also resulted in the creation of a multicultural, multiethnic society with a vibrant exchange of knowledge, substances, languages, religions, artefacts, and peoples all over central Asia, connecting Europe to India to China. As part of this diverse culture, medicine in China became more exposed than ever to the theories, clinical techniques, and medicinal substances of Greek, Arabic, Tibetan, Mongolian, and Indian medicine. In addition, the Mongols eventually succeeded in reunifying the north of China with a much more developed south. 2. The cultural openness, confidence, and dynamism of the early Ming dynasty, exemplified by the famous seven voyages of Admiral Zheng He in his fleet of “treasure boats” between 1405 and 1433 was abruptly replaced with xenophobia and isolationism, especially after a humiliating defeat of the imperial army at the hands of the Mongols in 1449. Rather than collecting tributes in the Indian Ocean and bringing home giraffes from Africa, the Ming rulers turned their focus to defending against Northern invaders by fortifying what would become known as the Great Wall. 3. The cultural and economic development of the Jiangnan region south of the Yangzi from the Song period on introduced different diseases into mainstream Chinese medicine. Consequently, both medical theory and clinical therapy expanded, as exemplified by the School of Warm Diseases 溫病 and an emphasis on supplementation of weak deficient Southern bodies. From the Ming dynasty forward, famous literati physicians tended to come from medical lineages in the Jiangnan area. Against this backdrop, Li Shizhen 李時珍 lived and worked in the late Ming dynasty (1511-1593). Descended from a medical family, he ended up becoming a doctor like his father after he failed the highest level of the civil service examination. Besides being an accomplished physician and compiling one of the greatest books of Chinese natural history and eleven other medical texts, he was a voracious reader, skillful poet, and dedicated scientist and naturalist who spent decades traveling throughout China for his textual, oral, and clinical research. In his relentless pursuit of knowledge, he interviewed countless local sources and interacted with people from all backgrounds. He is reported to have poisoned himself repeatedly by experimenting on his own body and investigating the objects of his research directly by dissection, close observation, and even smelling and tasting. The reader should be warned that Li’s passion for research in his subject matter may be contagious and that it is easy to get lost in the plethora of mind-bending stories in his book. · “Elucidation of names” 釋名: Including sometimes lengthy lists of alternate names and discussion thereof, this philological preoccupation with naming can be traced back to the Confucian emphasis on “rectifying names” 正名 as an important aspect of scholarly activity. · Elaboration 發明: Perhaps the most useful part for clinically inclined readers, this section elaborates on the reasons why the substances has the effect on the body described in the “Indications” section. · “Attached formulas”: This section not only cites earlier sources, written and oral, but also includes Li’s personal experience, thereby providing great insight into the actual clinical use of the substance in the late Ming period. Probably the most innovative feature of the Bencao gangmu is the classification of substances: In the earliest edition of the earliest transmitted bencao text, the Shennong bencao jing 神農本草經 (“Divine Farmer’s Classic of Materia Medica,” translated and published by yours truly here), contains 365 substances categorized into three levels associated with Heaven, Humanity, and Earth in that order, based on their effect on the body and with generally increasing levels of toxicity. This text does employ the system of the Five Dynamic Agents 五行 to classify the substances according to flavor, but not as an organizing principle for the text itself. In his later edition from 492 CE, Tao Hongjing uses the distinction between minerals, plants, and animals, in that order as his main organizing principle, and then subdivides each of these categories into the three classes of Heaven, Humanity, and Earth. Subsequent materia medica text followed this general organization but changed the order to start with plants, followed by minerals, then animals, and ending with human substances. In sharp contrast to his predecessors, Li Shizhen used the Five Dynamic Agents wuxing 五行 as the overarching paradigm for organizing all substances that affect the human body and therefore created the following major “parts” 部: Waters, Fires, Earths, Metals and Stones, Herbs, Grains, Vegetables, Fruits, Trees, Clothes and Utensils, Bugs, Scaly Creatures, Shelled Creatures, Birds, Quadrupeds, and Humans. Of these major parts, the first three (waters, fires, and earths) are a radical departure from previous bencao literature! The order of the wuxing here does not follow either the cycle of creation or the cycle of control, but instead is subordinated to what Carla Nappi describes as progressing “from the most fundamental to the most exalted.” These large “Parts” 部 are then subdivided further and further into “Categories” 類 and individual Entries 種. For example, we go from “bugs” to “egg-born bugs” to “bees,” or from “herbs” to “mountain herbs” to “gancao.” Besides this emphasis on correct classification and rectification of names, the organization of substances in this text also reflects the Confucian preoccupation with hierarchical ordering of the natural world, especially in the progression from plants to animals (and therein from bugs to scaly to shelled creatures to birds and then quadrupeds) and lastly to humans. Though he lived in the sixth century, Zhiyi (538–597) has a lot to teach the modern practitioner of meditation, whether Buddhist or secular. He is best known as the founding patriarch of the Tiantai school of Buddhism, widely considered to be the first native East Asian school, and thus a precursor to Chan and other later developments. Among the foundational writings of Tiantai are several treatises on meditation composed by Zhiyi. Although it is popular to think of meditation as a solution for all kinds of illness, Zhiyi knew it was more complicated. 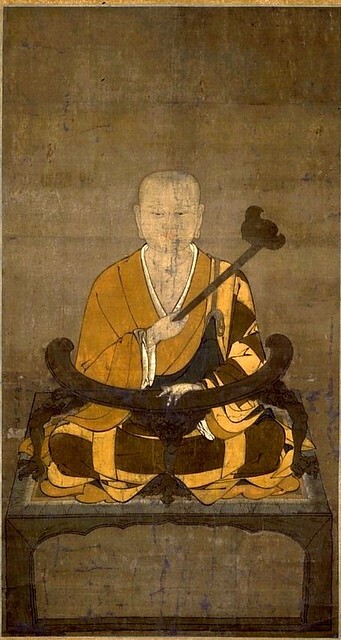 In his Shorter Treatise on Samatha and Vipasyana (in Chinese, Xiao zhiguan), Zhiyi suggests not only that not all illnesses can or should be treated with meditation, but that meditation itself can be a cause of illness: one might be unskillful in harmonizing the mind, body, and breath, and thus fall ill. But he does advise eight different healing meditation practices. 1. Settle the mind on the location of the illness. 2. Settle the mind on the dantian,* one inch below the navel. 3. Settle the mind on the soles of the feet. 4. Abiding calmly, remain aware that all phenomena (including the illness) are empty. 1. The Six Breaths, a Chinese exercise in which the practitioner makes the sounds “chui,” “hu,” “xi,” “he,” “xu,” or “si,” while exhaling in order to regulate internal processes. 2. The Twelve Respirations, which are different types of Indian breathing exercises (pranayamas) intended to regulate various symptoms of illness. 4. Finally, Zhiyi mentions using both samatha and vipasyana together to “analyze the non-existent nature” of physical and mental illnesses, resulting in their spontaneous healing. Lamentably, Zhiyi does not give us much detail on specifically how to practice the techniques mentioned in this particular chapter. (Zhiyi did write instructions on samatha and vipasyanameditation, much of which has been translated into English. [Chih-i 1997; Zhiyi 2009]) The most detailed descriptions he gives concern the specific medical applications of the Six Breaths and for the Twelve Resiprations. Imagine each of the Six Breaths revolving around inside your mouth and between your lips, and then make [the sounds]. If you are in meditation, use chui when you are cold and hu when you are hot. In the treatment of illnesses, chui is for eliminating cold, hu is for eliminating heat, xi is for eliminating pain and treating wind, he is for eliminating mental troubles and also flatulence, xu is for breaking up phlegm and relieving congestion, and si is for replenishing exhaustion. If you are treating the Five Viscera, the two breaths of hu and chui can treat the heart, xu is for treating the liver, he is for treating the lungs, xi is for treating the spleen, and siis for treating the kidneys. Now, to explain how the Twelve Respirations relate to the treatment of symptoms: the upward respiration cures weight gain, the downward respiration cures feeling spent, the falling respiration cures emaciation, the scorching respiration cures bloating, the increasing respiration cures depletion [of the Four Elements], the dissipating respiration cures [their] excess, the warming respiration cures cold, the cooling respiration cures heat, the forceful respiration cures blockages, the retained respiration cures trembling, the harmonizing respiration completely cures disharmony of the Four Elements, and the nourishing respiration nourishes the Four Elements. One who is good at using these respirations can cure any and all afflictions—but, as you can infer from this, doing them wrong can cause even more afflictions to arise. 1. Faith in the effectiveness of the methods outlined in the text. 4. Staying entirely focused on the object of the meditation one chooses. 5. Clearly discriminating the causes of illness (presumably in order to apply the correct meditation). 6. Using skill in choosing the right practice for the ailment in question. 7. Maintaining a long-term perspective and not giving up when results come slowly. 8. Knowing when to continue with a beneficial practice and when to abandon a non-beneficial one. 9. Avoiding mental distractions and moral transgressions. 10. Avoiding hindrances to practice such as pride and frustration. Zhiyi lived in a very different religious and medical culture than we do today. Throughout the essay, we see that his notion of illness revolves around traditional Asian medical concepts, such as qi and the “five viscera” from Chinese medicine and the “four elements” from Indian classical medicine. However, it is quite possible that Zhiyi’s essay is describing contemplative techniques that can be proven to be efficacious in the modern context. At the very least, he is pointing out avenues beyond the current fixation on mindfulness meditation that merit further medical research and exploration. * Qi or energy center. C. Pierce Salguero is an interdisciplinary humanities scholar interested in the role of Buddhism in the cross-cultural exchange of medical ideas. He has a PhD in the history of medicine from the Johns Hopkins School of Medicine, and teaches Asian history, religion, and culture at Penn State University’s Abington College. He is the author of numerous books and articles on Buddhism and medicine, including Buddhism and Medicine: An Anthology of Premodern Sources. Chih-i. 1997. Stopping and Seeing: A Comprehensive Course in Buddhist Meditation. Translated by Thomas Cleary. Boulder, CO: Shambhala Publications. Zhiyi, Shramana. 2009. The Essentials of Buddhist Meditation. Translated by Bhikshu Dharmamitra. Seattle: Kalavinka Press. Salguero, C. Pierce, ed. 2017. Buddhism and Medicine: An Anthology of Premodern Sources. New York City: Columbia University Press. What many people don’t glean from the passage is that the Su wen presents the principles for the practice of ecological medicine, based on living in harmony with natural law and its influences on the intricacies of human health. This has been known since ancient times, first mentioned in the Mawangdui manuscripts, as nourishing life (yǎng shēng 養生). The ideal way of life attributed to the sages is based on the intrinsic harmony of heaven (sky) and earth, and the human being as an intermediary between these poles of existence. So right at the beginning of Chinese history, we are seeing that the human being has a profound influence on the world around us. In modern times, the predominating dogma(s) in modern science, on the one hand, are that nature is unconscious, working according to Darwinian mechanisms that push survival and adaption forward. On the other hand, are the religious fundamentalists who believe that such phenomena as climate change are a hoax, and free-market evangelists who believe that energy companies should be deregulated and be allowed to despoil the environment in the name of economic need and job growth? Nowhere is this problem more acute than in mainland China, as we discussed above. The closest modern theory I could find from a scientist is James Lovelock and Lynn Margulis’ “Gaia Principle,” which states that the Earth is a living being that responds to our activities. One of the great sea changes of the scientific revolution in the West was the complete repudiation of what is called the vitalist principle, the concept of a life force in creation that animates all living and sentient beings, replaced by a more mechanistic view of life. In my opinion, this is the biggest rift between Western and Chinese medicine. And to the degree that Chinese medicine abandons so-called vitalism, it moves far from its Han dynasty sources. What’s most interesting about this discussion of whether or not doctors should recommend acupuncture for pain is a total lack of discussion of the other available treatment options that doctors and patients decide amongst and how acupuncture compares in terms of efficacy, effectiveness, safety and cost-effectiveness. Surely this is the only reasonable starting point for any intelligent discussion about how healthcare resources should be utilized to best help this patient population. If we look at sham controlled studies of orthopedic surgery, we find not a small difference between surgery and the sham procedure but no difference at all.4 Clearly surgery and acupuncture have similar methodological challenges to being studied using the double-blind RCT study design held as the gold-standard for pharmaceuticals. If lack of practitioner blinding is such a powerful force as the authors suggest, surely this should have a much stronger effect in the case of surgery, which is more invasive and more expensive (factors that we’re told influence acupuncture outcomes), and yet there’s no difference between fake surgery and the real thing when it comes to reducing patients’ pain. It seems odd to argue against something with at least small specific effects and large non-specific effects (in other words, large proven clinical effects in helping patients reduce their pain) rather than something that’s ineffective, invasive and expensive to boot. It’s also helpful to note that studies of placebo, including Hrobjartsson’s own research, repeatedly and consistently demonstrate that placebos are ineffective and while they can bring short-term benefits for subjective outcome measures such as pain, they don’t work in the long-term at all.56 This is diametrically opposed to what we see in acupuncture research. Acupuncture brings meaningful reduction in pain symptoms that persists at 12 months,7 as Dr Cummings has pointed out. No placebo has been demonstrated to do this so I’m curious if the authors are arguing that acupuncture is a particularly special placebo unlike any other that has ever been studied before. Of course, this would be special pleading, which is an argument firmly rooted in the authors’ own bias rather than faithfully interpreting the evidence in a consistent and objective way in order to best help patients. This comes after another recent review of paracetamol for spinal pain and osteoarthritis, also published in this journal, that finds that “paracetamol is ineffective in the treatment of low back pain and provides minimal short term benefit for people with osteoarthritis” 10. In short, paracetamol is widely used and prescribed, increases the risk heart attack, stroke, kidney damage, GI bleeding and death, and we don’t know how it works which is moot because it doesn’t work anyways. In that light, doesn’t it seem a bit silly to debate whether or not to recommend a treatment that is repeatedly demonstrated to be efficacious, effective, cost-effective, and safe, where the only question is exactly how much of its sizable clinical effect is down to the specific effects through analgesia induced through mechano-transduction and how much is due to the ambiance of the acupuncture clinic or the caring disposition of the clinician? Another mainstay of pain treatment in the NHS are NSAIDs. This class of drugs suffers from a paucity of long-term clinical data but are frequently prescribed indefinitely, despite serious risks. A recent review looking at over 400,000 patients, also published in this journal, found that “All NSAIDs, including naproxen, were found to be associated with an increased risk of acute myocardial infarction” (which is fancy medical speak for ‘heart attack’) when taken for any time period, including as little as one week.11 A now out-dated and absurdly conservative estimate shows that the adverse effects of NSAIDs costs the NHS a median estimate of £251 million pounds a year.12 This figure is only based on the cost of treating GI perforation and doesn’t take into account any of the heart attacks and strokes caused by NSAIDs when taken as directed. Of course, the harms caused by NSAID and paracetamol consumption pale in comparison to those of opioids, which are extremely addictive, frequently debilitating and often lethal (in the UK, deaths related to prescription opioids doubled between 2005 and 200913), which is why until a successful albeit illegal marketing campaign by their manufacturer in the 1990’s, oral opioids were only available as part of end-of life pain management for terminal cancer patients. In this light, it’s interesting to note that the first and only study ever performed on long-term effectiveness of opioids for pain-relief found that those taking opioids were actually in more pain than their non-opioid popping counter-parts.14 Talk about a poor benefit to harm ratio! While NICE guidelines for various pain conditions urge doctors to use these drugs sparingly and as a last resort, recommending against using acupuncture as a treatment for pain directly increases the usage of these drugs, which is clearly in no one’s best interest and makes the recommendations seem disingenuous. As acupuncture has been repeatedly demonstrated to reduce the consumption of pain medication, including opioids and NSAIDs, surely a discussion of the cost of acupuncture should take this into account, given how much treating the harms of these drugs costs the NHS each year. Indeed, if we look at the cost-benefit ratio of what’s typically offered for pain, it would be more germane to discuss the cost to the NHS and harms to patients of not recommending acupuncture. Compared to physiotherapy, acupuncture has a much stronger evidence base. As one point of reference, there are over 10,000 trials on Cochrane’s Central Register for acupuncture compared to under 7,000 for physio (ironically, this latter number includes studies of physios doing acupuncture). With this in mind, it’s interesting to note that physios frequently add acupuncture to their practice (the UK’s Acupuncture Association of Chartered Physios boasts over 6,000 members), often after very minimal training, contrary to World Health Organisation safety recommendations. It’s difficult to reconcile why physios would increasingly start using acupuncture if it didn’t work and their own tools that they learned in their training yielded satisfactory results in practice. Are you suggesting that physiotherapy techniques are so ineffective at treating pain that thousands of physios are offering a placebo to their patients instead? Any discussion about which treatments should be recommended for pain that center on patients’ wellbeing and the allocation of precious healthcare resources should be based on a comparison of the benefits versus the harms of available treatments. This is self-evident. Such an approach, no matter how you slice the evidence-base, leaves acupuncture amongst first-line treatment options for pain, if not a clear winner. If Hrobjartsson and Ernst insist on banging the disproven placebo drum despite repeated demonstration of specific effects, clinical superiority over treatments that themselves are shown to be superior to placebo and despite the scientific community’s clear understanding of specific mechanisms of how acupuncture is able to achieve these results, then the discussion we should be having is not about the ethics of recommending placebos. Rather the discussion would need to be about the ethics of recommending treatments that fail to outperform or in some cases are inferior to a treatment that you claim is s placebo, all while exposing patients to considerable and avoidable harm. That’s the only logically consistent reading of your suggested interpretation. So let’s have a discussion about the ethics of that. In the interest of patients and the responsible provision of healthcare resources, I sincerely invite the authors to explain: if not acupuncture for pain, then what do they recommend instead and based on what evidence? If they are unable to provide evidence of a more effective treatment, one with stronger evidence of positive effect, one that does not unacceptably harm patients, then perhaps a reconsideration of providing such a respectable platform for such outdated and un-evidenced opinions is appropriate, as it directly puts patients at risk while impeding access to a proven and effective treatment for a poorly treated affliction. The post According to the evidence, of course doctors should recommend acupuncture for pain appeared first on A Better Way To Health. Before ordaining as a monk in Thailand, Candasaro had worked at a private factory as a production manager in Sichuan for over 30 years. In 2008 he started exploring Theravāda meditation by learning observing the breath[i] with Pa-Auk Sayadaw’s method at Jiju Mountain for about two months in Yunnan. He later gave up this practice as he could not see any sign[ii] emerged in his sitting. “My personality is quite fast-paced. It’s difficult to cultivate calmness.”[iii] In May 2011, he firstly learnt about the practice of dynamic movement at a ten-day retreat led by Luangpor Khamkhian Suvanno, from Thailand, in Hongzhou. [iv] During the retreat, he tasted a sense of joy[v], a positive outcome of meditation. In this huge forest temple, there were around 30 monks and 30 lay people only. As there were plenty established huts, every resident could stay in one hut. [viii] Every morning, all residents woke up at 3 o’clock in the early morning to prepare for the chanting and dhamma talk at 4 o’clock. Around 6 am, Candasaro and other monks, dressed in yellow monastic robe, formally visited villages nearby carrying their alms bowls for their daily alms round. (See Fig. 3 and Fig. 4) In Chinese Buddhist communities in China, alms round practices have been faded out for many centuries. With bare feet, the monks lined up tidily first and started walking towards one of the target villages. After entering the village, they stopped in front of a household where donors were waiting with cooked rice and food. Whenever people from households offered food to monks one by one, they would line up before the householders and chant blessing words in Pāli. All the monks went back to the monastery with the received alms. At around 7.30 am, volunteers in the monastery kitchen finished preparing the foods so that the monks and all residents could have their first meal. For monks, this was also the only meal according to their precepts. Although Candasaro could not speak English, he had learnt some basic Thai words to communicate with Thai people for his daily basic needs. Over the past four years, he went back to China a few times to attend retreats and also invited some friends to travel to WatPa Sukato. In 2017, he returned to China and settled in Fujian Province. He started teaching dynamic meditation and led alms round in the village. [i] Ch. guanhuxi; P. ānāpānasati. [ii] Ch. chanxiang; P. nimitta. [iii] Ch. ding; P. samādhi. [iv] Luangpor Khamkhian Suvanno was a disciple of Luangpor Teean. [v] Ch. xi; P. piti. Since 2008 he has attended ten-day vipassanā retreats of Goenka’s method for ten times, twenty-day for once and thirty-day for twice. [i] He has also served ten-day vipassanā retreats ten times as a volunteer helper. [ii] Nowadays he practices meditation for two hours every day. He found that his physical health has improved. His mind has become more balanced and more compassionate. “I had suffered from Ankylosing Spondylitis, a disease related to immune system. It took me a few minutes to get up from sitting meditation posture. After I insisted to practice regular meditation, my body has been improved a lot. I feel that the body is full of energy after meditation.” However, he emphasized that a right attitude of meditation practice is important. In the beginning of his practice, he hurt his leg as he tried to strive for good results. [ii] It is usually called as Dhamma worker (Ch. fagong). [iii] Ch. wuchang; P. anicca. [iv] Ch. wuwo; P. anattā. [ii] Sayadaw U Indaka is the disciple of Chanmyay Sayadaw following the lineage of Mahāsi Sayadaw. [iii] See U Tejaniya 2014. Lu Hongji emphasized that it is important to learn meditation from an experienced teacher with skillful instruction skills. He said, “A good teacher can guide students to overcome any difficulties during meditation. Meditation can improve physical health. Once I gave meditation instructions to a few young people. The body of a student was weak. While he was practicing sitting or walking meditation, his body moved obviously. Strong reaction during meditation reflects that the body is weak.” He explained that, “[From the perspective of Buddhism], physical movement is a reaction of the wind element. That is also an imbalance of the four elements (the earth element, the water element, the fire element and the wind element). From the perspective of Chinese medicine, practicing meditation gives rise to positive energy (Ch. yangqi). The physical reaction is due to the interaction of the energy and the blocking area in the body.” Although meditation can heal the body, Lu reminded that one cannot strive in meditation practice. Meditators should prepare their body with a balance of four elements before the development of the mind.